The CC26x2R devices are part of the SimpleLink™ microcontroller (MCU) platform which consists of Wi-Fi®, Bluetooth® low energy, Sub-1 GHz, Thread, zigbee, 802.15.4 and host MCUs, which all share a common, easy-to-use development environment with a single core software development kit (SDK) and rich tool set. A one-time integration of the SimpleLink platform enables you to add any combination of the portfolio’s devices into your design, allowing 100 percent code reuse when your design requirements change. For more information, visit www.ti.com/simplelink. This LaunchPad kit supports programming and debugging from Code Composer Studio™ and IAR Embedded Workbench® integrated development environments (IDEs). You can kick start your development with the SimpleLink CC26x2R LaunchPad and the SimpleLink CC26x2 SDK. 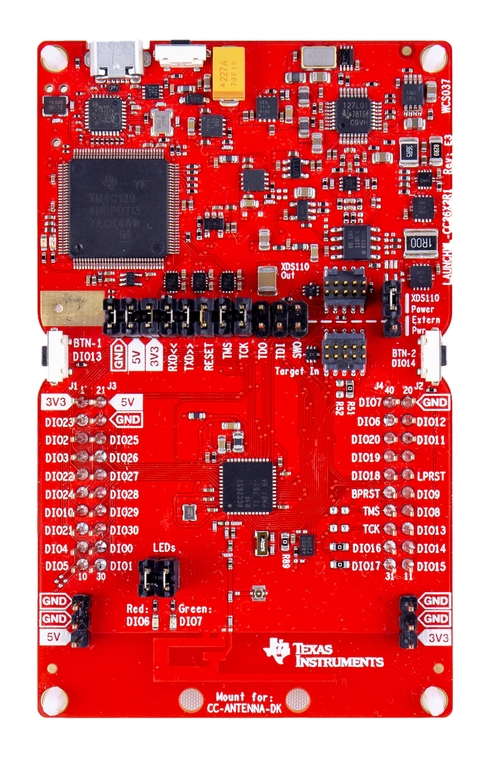 The SimpleLink CC26x2 SDK includes the Texas Instruments royalty-free Bluetooth low energy (BLE) software protocol stack (BLE5-Stack) component supporting development of single-mode Bluetooth 5 applications on the ARM® Cortex®-M4F based SimpleLink Bluetooth low energy CC2642R wireless MCU and SimpleLink Multi-Standard CC2652 wireless MCU. The BLE5-Stack includes all necessary software, sample applications and documentation to quickly get started with the development of standalone and network processor BLE applications. With the SimpleLink CC26x2R LaunchPad and the CC26x2R SDK you can kick start your development of Thread-based application for the CC2652R wireless MCU. The SimpleLink CC26x2R SDK includes tools, application examples, documentation and source code of the Thread 1.1 networking protocol based on openthread (github.com/openthread/openthread), an open-source implementation of the Thread networking stack. Example applications such as a door lock, window shades, thermostat and temperature sensor applications, based on Constrained Application Protocol (CoAP) running atop of the Thread networking stack are released to kick-start the SW design of end equipment sets. Additionally, the SimpleLink CC26x2 SDK includes a Command-Line Interface (CLI) application and a Network Co-Processor (NCP) implementation, which can be used in combination with a host Thread border-router agent software as a whole Thread border router reference solution (https://github.com/openthread/borderrouter). The SimpleLink CC26x2R LaunchPad and the SimpleLink CC26x2R SDK supports a Zigbee solution, delivered as plugin, which runs on the SimpleLink MCU framework (TI-RTOS, CCS / CCS Cloud). The Zigbee plugin contains everything needed for a Zigbee compliant solution, including tools, application examples, documentation, and source code. It also includes a Zigbee Pro compliant Zigbee stack, as well as Green Power (GP) device and sink support. Example applications include door lock, light, switch, temperature sensor and thermostat. Sample applications are zigbee certification-ready. The Zigbee plugin also includes support for Zigbee Network Processor configuration, which can be used in two chip architectures where the host implements the Cluster Library and the Zigbee applications.